We had a great response to the picture of our roast dinner on twitter last Sunday including our ultimate Pigs in Blankets that are very easy to do and are a serious player on the plate! Remove sausage meat from skins of sausages or from the packet depending on which you have bought and add to a mixing bowl. Chop cranberries if desired and ad those to the sausage meat. Mix until all the cranberries are mixed in wit the sausage meat. ​Pull sections from the mixture and roll into a ball slightly smaller than a golf ball (about 1½ inches wide) The smaller the ball the more you will make but you don't want them too small or the cranberries will overpower the meat! ​Once all rolled into even sizes, place a rasher of bacon flat on the board. Place the meat ball on the fat end and roll the bacon around. 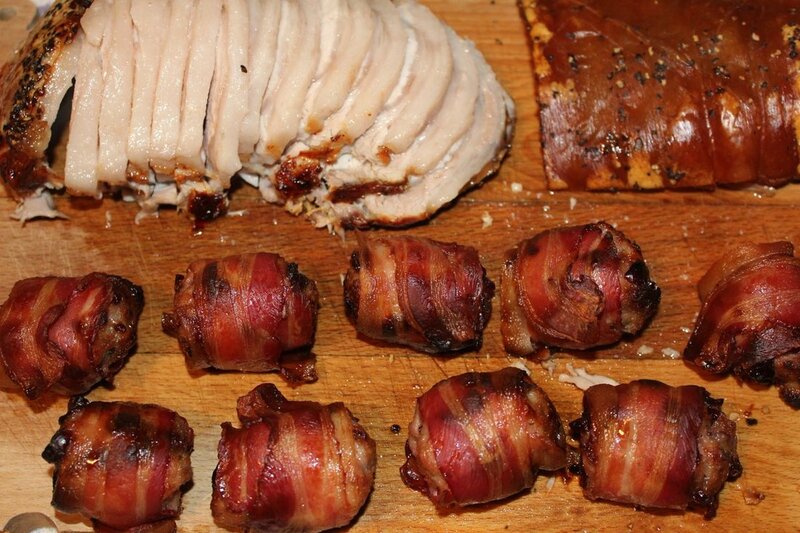 Do this for each ball of meat until each ball is wrapped in one rasher of bacon. ​If you have decided on using rosemary, cut a sprig for each roll and tuck under the bacon. As you can see from our picture, this is not essential but it does make them look festive! ​Place on a baking tray and put in a pre heated oven at 180°C in a fan oven. Gas mark 4 for around 25 minutes They are done when the look like ours in the picture. Smaller balls will obviously cook quicker.